Decisions on production and duplication often depend on the quantity. For example, if you would require fewer than 250 copies of your project, the most timely and cost-effective solution is burning CDs. Burned CD projects can often be turned around in 2 days. Or maybe you have a mass-production requirement of 500+ copies of your video. In this case, we press CDs in a state-of-the-art manufacturing facility. The duplication and delivery of video projects has been changed forever with the introduction of DVD. 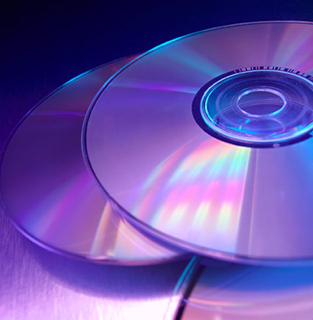 Although the duplication process is very similar to CD-ROM, a DVD can hold 120 minutes of video and has the added ability to offer a "menu" which can be used to choose areas of the DVD to watch. We provide full DVD Authoring using Mac's DVD Studio Pro. Small Run DVD projects can usually be completed in 1 or 2 days. While CD and DVD are great options, VHS is still often the solution of choice for many clients. PRO Video offers on site duplication facilities as well as conversion services from VHS to DVD or International Format Transfers to or from VHS. For a different solution, you may be interested in burning or pressing your video to a business card sized disk. We offer production and authoring for e-cards on site. With in-house capabilities of printing direct to disc we offer a professional looking product. There are endless ways to package your video. Choose from our catalogue ranging from hard covered jewel cases down to white paper sleeves. Other packaging selections include album cases, slim line jewel cases, cardboard and paper sleeves as well as plastic cases. For larger pressed runs full colour printing of packaging is also an option. The project is not complete until it is in your hands - and we manage and coordinate timely and safe delivery right to your door.